My 10 year old son has previously built the Stryder insect-like walking model (see our K'Nex Robotics review) and the huge and awesome Ball Factory which also required coding. I had helped him a bit but he took the lead on the building. This time I had to get more involved! My 8 year old understands a fair bit about robots, we built Roby the Robot Dog together as a family with him taking the lead on the design. He's done a bit of building with K'Nex and lots with LEGO but he's more of a tinkerer and often persuades his brother to do the instruction following! What Does the Dog Do? We couldn't find much information on what the finished dog would do. It makes a brief appearance in the promo video for K'Nex but that's all the information you get apart from the names of the models: Guard Dog and Hungry Dog. You can look at the code to figure it out but it doesn't have much documentation and you need to understand how the motors are connected to make sense of it. There are two downloadable programs for the Dog. You can download both of these onto the K'Nex control box and easily switch between them. One of the cool things about the Dog is that the program displays eye animations on the LCD screen to show the dog's mood. It also plays sound effects. Don't read the descriptions below if you want the behaviour to be a surprise but we would have liked to know more when we were building the model so we could understand what we were making. In Guard Dog mode the Dog detects an enemy, barks and moves towards the enemy. The Dog's jaw moves and it moves forwards and backwards using the motor controlling the back wheels. In Hungry Dog mode the Dog wants feeding and will try and get your attention in various ways. The Dog sits down on its hind legs which is a very cool mechanism. The Dog uses its colour sensor (located inside the mouth) to detect a red ball which makes it happy. You can use the tail, which is attached to a push button, to reset the Dog into its standing position. It's a good idea to put batteries in before adding the control box. It's added near the end in this model though so changing the batteries is possible. You can power the control box from a power supply but this model moves around so you'll want batteries. You can add the code first but there's no need as you can easily connect the control unit via USB later when the Dog is built. We worked through the instructions over a couple of hours. My son built parts and I made the connections that are harder to snap together. We put our brains together to work out how pieces went together. I realised what an amazing job my older son had done with the other models - he just instantly sees how parts go together in 3 dimensions. We had to work a little harder, spatial awareness is not a strength of mine! We didn't have any trouble following the instructions and had lots of wow moments when a weird piece we had just made attached to the main model at several points. We were a bit confused by one of the motors that didn't seem to have anything to keep it in place. It ends up being held up by a USB cable, but you don't find that out until the end. The Dog uses all four of the K'Nex motors plus the distance sensor, colour/light sensor and the push button. I connected up all of the electronics as it's really hard to see which way the cables need to go once the components are in the model and it would be easy to damage them - the instructions warn you to be careful. There are symbols on one side of the connectors but once everything is in different positions it's hard to figure out which way is up! 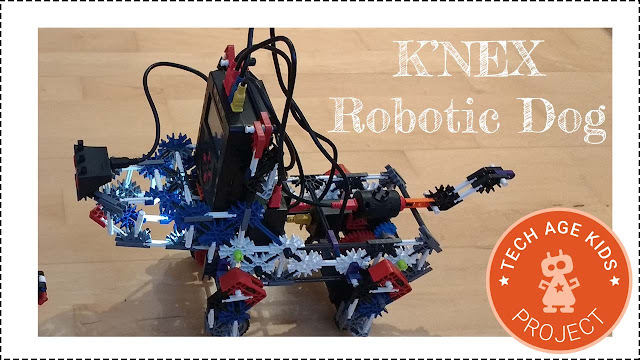 You use the K'Nex Robotics software to open and then download the programs. These both work with the same model and can both be loaded on to the control unit - it's easy to switch between them. We recommend trying the Guard Dog model first as it's simpler. We found that I had connected two of the motors the wrong way round oops. A piece popped off and I was able to quickly correct the mistake. Make sure you check the wiring carefully! As is often the case though, making a mistake helped us to understand the model better and realise that the models can cope with some mistakes. We found that the Guard Dog activated instantly every time. We knew the issue as we'd seen it with the Stryder model. The distance sensor uses 300mm as a threshold but our distance sensor never reports distances that high. To fix this we changed the threshold in the code to 250mm and downloaded the code again. The Hungry Dog program has a lot more detail to it! The Dog goes through various stages trying to persuade you to give it the red ball. It also uses the motor attached to the hind legs to get the dog to sit. Once the model is built and the code is downloaded it's payoff time. We were pretty impressed with how the Dog moves, it's a pretty neat mechanism. The LCD eyes and sounds really add to the overall effect and give an idea of what you can do. We did find that sometimes one of the motors would get into slightly the wrong position. 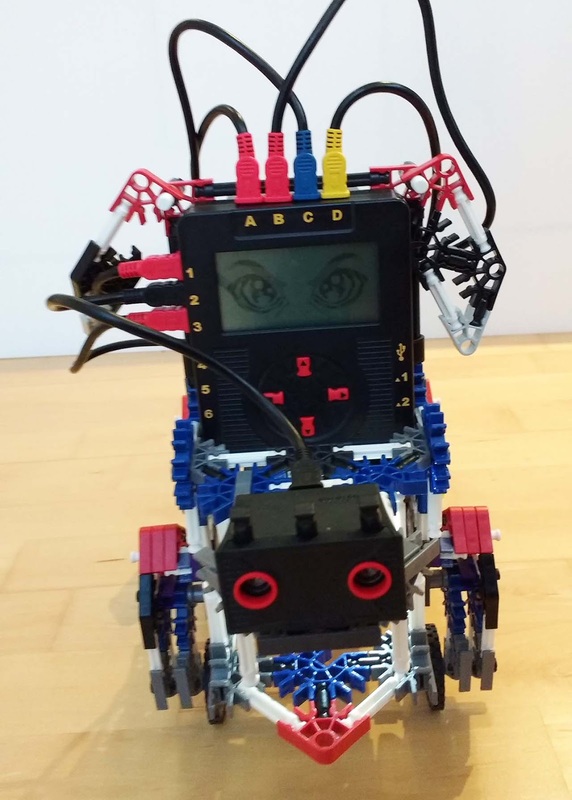 When we met up with the Data Harvest team behind the K'Nex Robotics kit at the Bett Educational conference they showed us how to quickly fix this. In the editor you can click on a motor and change its positions. Fantastic, knowing that makes things much easier. The dog is definitely a fun model. My eight year old particularly liked the jaw movement, he's been wanting to add a moving jaw to his own robot dog for a while. We love the clever movement of the legs which means that the dog can lower its back legs into a sitting position. The front legs can also be lowered. 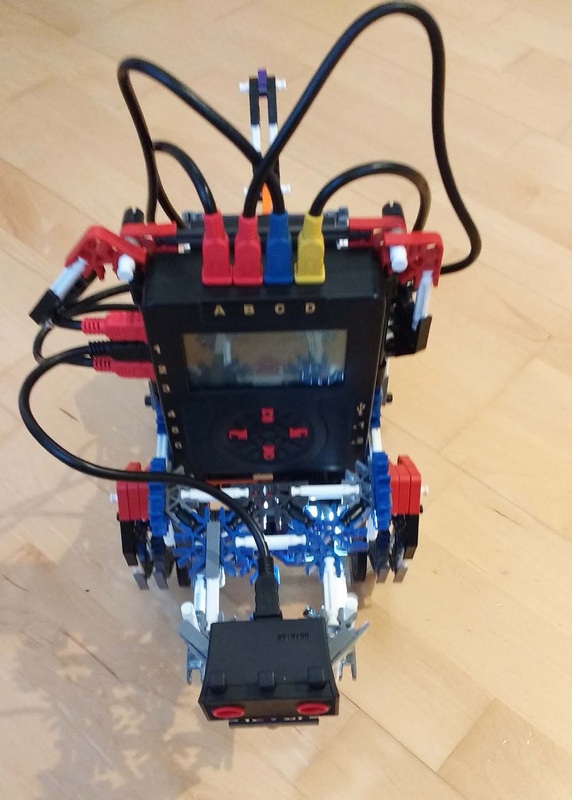 This is where having four motors in the kit really makes a difference with K'Nex robotics, each model has lots of movement which is really interesting. Having now experienced building a full model myself I realise the skill involved in following the instructions and I'm amazed that my 10 year old found it so straightforward. This is definitely a fantastic way to develop and stretch spatial awareness skills. This is the first model we had built that made us of the LCD display and playing sound effects. This gives lots of scope for designing cool robots with personality. We're really enjoying the K'Nex Robotics Kit as a great option for learning about robotics at home. Definitely worth considering for kids who are interested in robotics and want to develop their knowledge.